Fly through the sky, run through the forest, dive into the water. You are the Dragon. Please post your joining form filled out in this topic. You should soon be accepted, but until then, you must wait to Rp, and create topics. Markings: Under belly is an armor-like substance with a silvery coloring. His horns and his four-spiked tail-tip are light grey. His spines/spikes are black. Personality: Loner; serious; quiet; cautious; not easily angered, but when he is -- watch out. Give an example of your character saying something: "If you fight for glory, you fight for nothing. And what kind of Dragon fights for nothing?" Your accepted! You are in the teacher group. You may start Rp once you post your biography. (You may use parts of your form here). Size: Since Hail is a pygmy dragon, she stands 60 cm tall, and 60 cm long. Personality: Hail is a bubbly little dragon. Even though she has just become a young adult, sometimes she can be a little immature and act like a kid. She loves flying, and she can often be found entertaining herself by doing new tricks and stunts. She also likes to show off in front of people. Life cycle: I’ll put this in the bio, since I’m yet to figure out her markings. Give an example of your character saying something: “Good things come in small packages!” Hail exclaims happily. Give an example of your character doing something: Hail - being the silly character that she is – runs around in circles many times before getting dizzy, stopping herself by opening out her wings. She huffs and puffs before collapsing on the ground, hugging herself with her wings to keep warm. Along his snout, neck, back, tail and shoulder blades dagger-like blue markings are present. Gray, silvery spikes run along the length of him, a large horn protruding from either side of his head. His tail is webbed, the webbing being the same blue as his markings. 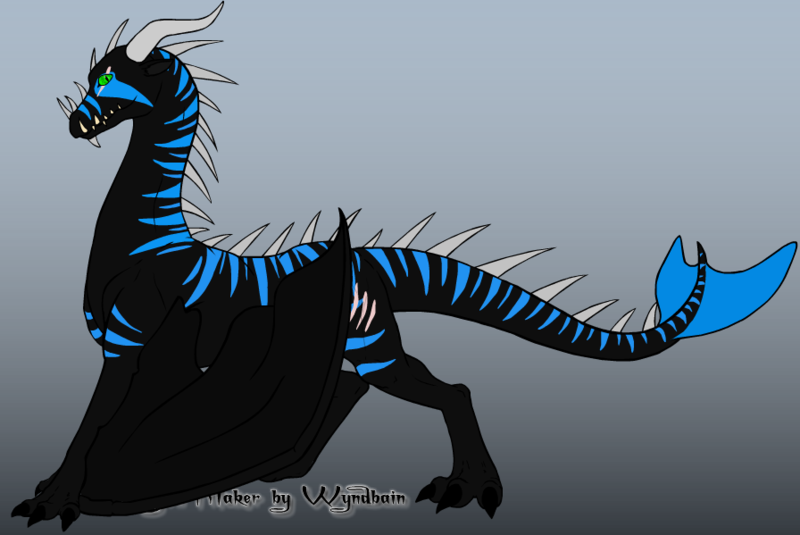 His wings are similar to webbing, stretching from his upper leg to ankle of his front legs, both being the same charcaol black as his base color. His webbed wings make it harder to fly, and Vodi has yet to learn how. His front feet have aposable thumbs, making things easy to grasp. Like his mother's watery roots, he breathes water, but taken on the danger of fire from his father, it creates an icey blast. After his father trying to train him as a earth dragon, he learned to breathe fire, but it's very weak as the natural water source within him depletes the flame before it can become a full, dangerous blast. Vodi is rather large, standing 21 feet tall, and 47 feet long. His eyes are both a bright green. A single scar runs through his left eye, and three claw-like scars mark the tale of a past battle on his left thigh. His right horn as a rather large crack in it as well. Vodi is very hostile towards strangers, and wise for his age. Though he may seem rude or cruel, once you get to know him and he begins to trust you expect to find a very kind, and overall happy dragon. He loves nothing more than to have a good time, his childish antics still with him. Vodi was raised by his mother, as normal the father was not permitted to care for them. It was just clan rule, and no one objected. He grew up fast, being the only hatchling that century, and it was hard times. He dispersed early, finding a life of his own, only knowing the way of the water dragons, as his mother was. He knew he was different, he didn't look like a water dragon but he never questioned it. On his journey as a young loner, he came across an old dragon, and instinct told him it was his dad. 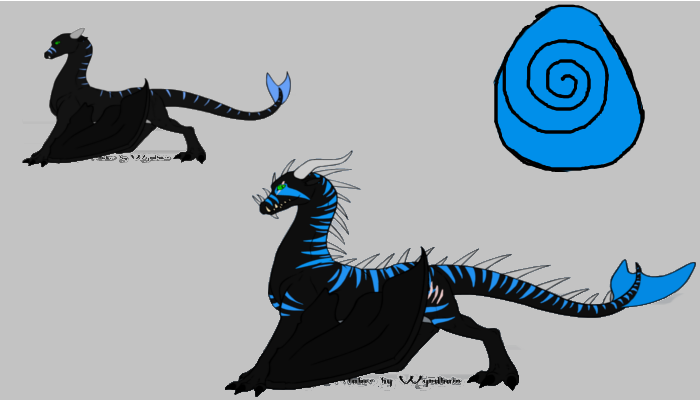 His father taugh him the ways of the earth dragon, and Vodi learned quickly and eventually left his father as well, then finding the clan of dragons he lives with as of now. Am I a Grasshopper or Sensei? I would say a sensei, I've never roleplayed a dragon, but I have lots of role-playing expierience. "Alas, the sun is disapearing behind the trees let us sleep and gather energy, as I won't be content to laze around tomorrow" I huffed, flicking my tail impatiently. I've never expierienced the thrill of flight. It's not fair. I thought crossly, watching dragon's soaring through the air. I trudged to the crest of the hill stopping to admire the view, imagining soaring over the landscape, but sighed when I knew I can't. I inhaled sharply, taking in a deep breath, my chest swelling with the air. I paused before exhaling quickly through my nose, coming with the air a cool icey blast. The picture won't work for the anatomy of Vodi, so I'll make my own life cycle for him. Sorry for the failness of the egg was 4am... not my best time. Your accepted, you can post your bio then rp! Scars: a small one across his mouth, one across his left eye and a slash mark on his back right hip. History: diamonte was raised lie any other dragon, but he was always a little different, when he was young he was a violent dragon, until he met a human. after being convinced not to freeze the human solid they soon became friends, the human was a scholar and taught diamonte many things, like how to see the beauty in everything. diamonte soon lost his violent personality and became a calm, wise dragon instead. Give an example of your character saying something: "any dragon can win a fight with brute force, but it takes a smart dragon to win by cunning and intelligence." Give an example of your character thinking something: i wonder if there will ever be a day when dragons and humans can live in peace and harmony. Give an example of your character doing something:diamonte slowly walked out of his cave, stopped, took a breath of the crisp morning air and closed his eyes as his morning meditation began. Please go make your Biography before rping! !